In the 1890’s researcher E.A. Martel said “No theory about the origin of caves is universal,” (Martel, in “Applications geologiques de la speleogie…”, Paris, 1896) meaning there is probably no single explanation that can account for all the caves in the world. With over 7000 known caves in the state of Missouri, that statement is probably true just for Missouri. 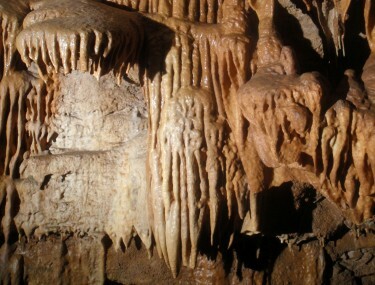 However, we can look at a few factors that are common to most of the caves in the Springfield Plateau portion of the Ozarks. topography that creates a “hydraulic gradient” inducing water to flow from upland areas to lowland areas. 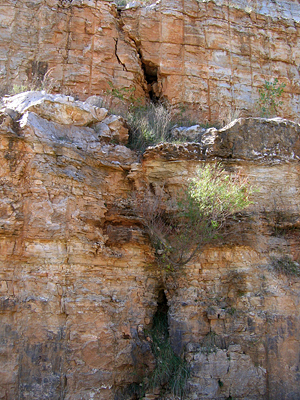 Most of southwest Missouri is formed on top of widespread layers of limestone. Limestone is a rock made up mostly of the mineral calcite, and the chemical formula of calcite is CaCO3. This means that one atom of calcium bonds with a molecule that is made of one atom of carbon and three atoms of oxygen. Interestingly, this mineral can dissolve very easily in weak acids, forming carbon dioxide gas (a CO2 molecule) and calcium dissolved in water. Most water seeping through the soil picks up weak amounts of acids as it flows through the soil, so when the water gets to the rock beneath the soil, it has enough acidity to slowly dissolve the rock. An example of this CO2 gas-forming process can be seen if you drop a little bit of weak hydrochloric acid on local limestone, the droplet will start to fizz just like opening a can of soda. Now that we understand how the water can dissolve the limestone, let’s look at the other processes that are common to forming caves in the Ozarks. First, let’s look at the topography. Topography is the name we give to the elevations of the land surface. Almost anyone who has driven from Springfield to Branson (or almost any other direction away from town) can tell you that there are some very deep valleys in the Ozarks. The Ozarks are actually an area where the land surface was pushed up from deep in the earth underneath. As the land was pushed up, rivers and streams wanted to stay flowing in lowland areas (the valleys). As a result, the difference in elevation between the present-day hilltops and valley bottoms is rather large. This large difference means that water that lands on top of the hilltops (or sits there in ponds) has a large amount of energy trying to push its way down into the valley bottoms. This is what we call a hydraulic gradient (gradient being another word for slope). Everyday examples of hydraulic gradients are found in most towns where there is a city water tower. One common reason for water towers is to use the pressure of all that water stored in the tank at the top (or on top of the hill) to push down on water in the water mains of the system. That way, whenever someone opens a faucet, there is pressure pushing the water through the pipes and out the faucet or the shower head. The elevation (and pressure) difference between the top of the tower and the faucet is a hydraulic gradient. In the Ozarks, we have many places where there is plenty of water near the “hilltop” (or in the soil on the hill) and it wants to find its way out into the “open faucet” of a stream down in the valley. This pressure will help push the water until it “finds” and moves through any available joint or crack in the rock.This brings us to our third component, the joints, cracks, and fractures in the rock. 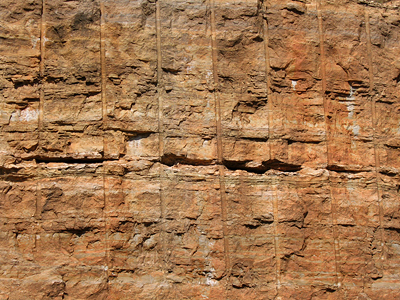 All rocks have some sort of joints, cracks, fractures or layers called bedding planes in them. As “aggressive” water (water that has some acid in it) flows through these fractures, it will dissolve away small amounts of the limestone. Over time, those small amounts can add up to a large opening. In fact, after a fracture widens to about 1/5th of an inch wide, the water moving through it can erode the opening in addition to dissolving it. Erosion is a physical process that breaks solid material into smaller grains that can wash away in the water (think of the sand and silt running in the bed of your local creek, it is actually sort of “sandblasting” the creek bed as it washes downstream). A second thing about the dissolving rock that helps form caves is that water tends to be most acidic in two places: right where it first contacts the limestone, and anywhere where it mixes with other water (like along a riverbank). 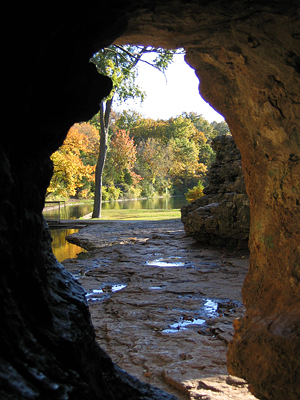 That is why most of the caves in the Ozarks are either found in sinkholes or along a stream bank – those two places are where most rock dissolves first. Now you know a little bit about where most caves are found (sinkholes and stream banks), how the limestone dissolves and erodes to enlarge smaller fractures into “cave-sized” openings, and the important roles that water, fractures in the rock and topography all play in forming most Ozarks caves. Join Us to eplore the wonders underground.